First Bull Run was a clash between relatively large, ill-trained bodies of recruits, led by inexperienced officers. Neither army commander was able to deploy his forces effectively, only 18,000 men from each side were actually engaged. Although McDowell had been active on the battlefield, he had expended most of his energy maneuvering nearby regiments and brigades, instead of controlling and coordinating the movements of his army as a whole. Other factors contributed to McDowell’s defeat: Patterson’s failure to hold Johnston in the valley; McDowell’s two-day delay at Centreville; allowing Tyler's division to lead the march on 21 July thus delaying the flanking divisions of Hunter and Heintzelman; and the 2 1/2-hour delay after the Union victory on Matthews’ Hill, which allowed the Confederates to bring up reinforcements and establish a defensive position on Henry Hill. On Henry Hill Beauregard had also limited his control to the regimental level, generally allowing the battle to continue on its own and only reacting to Union moves. Johnston’s decision to transport his infantry to the battlefield by rail played a major role in the Confederate victory. Although the trains were slow and a lack of sufficient cars did not allow the transport of large numbers of troops at one time, almost all of his army arrived in time to participate in the battle. After reaching Manassas Junction, Johnston had relinquished command of the battlefield to Beauregard, but his forwarding of reinforcements to the scene of fighting was decisive. Compared to later battles, casualties at First Bull Run had not been especially heavy. Combined Union and Confederate killed, wounded, and missing were less than five-thousand. Three months after First Bull Run Union forces suffered another, smaller defeat at the Battle of Ball’s Bluff, near Leesburg, Virginia. The perceived military incompetence at First Bull Run and Ball’s Bluff led to the establishment of the Joint Committee on the Conduct of the War, a congressional body created to investigate Northern military affairs. Concerning the Battle of First Bull Run, the committee listened to testimony from a variety of witnesses connected with McDowell’s army. Although the committee’s report concluded that the principal cause of defeat was Patterson’s failure to prevent Johnston from reinforcing Beauregard, Patterson’s enlistment had expired a few days after the battle, and he was no longer in the service. The Northern public clamored for another scapegoat, and McDowell bore the chief blame. On 25 July 1861, he was relieved of army command. 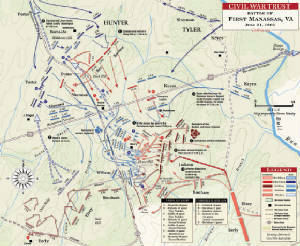 First Bull Run demonstrated that the war would not be won by one grand battle, and both sides began preparing for a long and bloody conflict (see: Battle of First Manassas: A Major Turning Point?). In the North, Lincoln called for an additional 500,000 volunteers with three-year enlistments, and the men with ninety-day enlistments were sent home. In the South, once the euphoria of victory had worn off, Jefferson Davis called for 400,000 additional volunteers. The battle also showed the need for adequately trained and experienced officers and men. One year later many of the same soldiers who had fought at First Bull Run, now combat veterans, would have an opportunity to test their skills on the same battlefield.